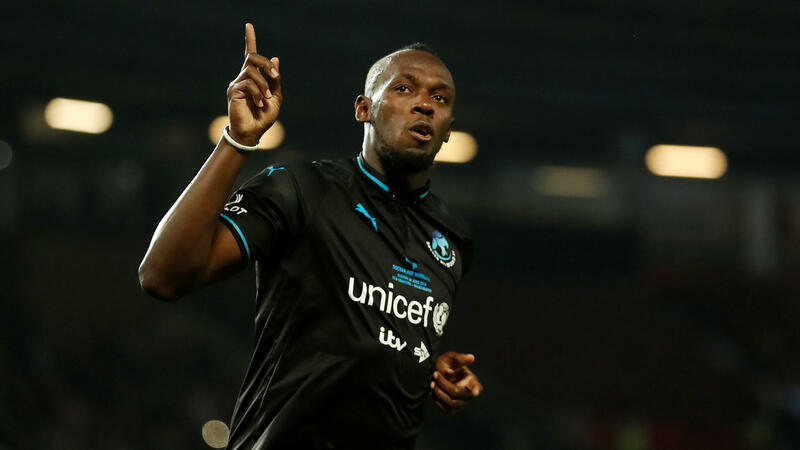 Usain Bolt, who retired as the world's greatest sprinter last year, wants to play pro soccer. He's seen here playing during a benefit game this summer, celebrating his score during a penalty shootout. Bolt, 31, has been in talks for months to join the Central Coast Mariners of Australia's A-League. After news of the talks emerged, numerous sponsorship bids – and even an offer of a place for Bolt to stay – quickly followed, the team says. "You can't even comprehend how big it is," said Mariners CEO Shaun Mielekamp, on his team's website. Elsewhere, the big news is being "met with equal parts skepticism and bewilderment," as Australia's ABC reports. Bolt is best known for his multiple Olympic gold medals, his world records in the 100-meters and 200-meters, and his "Lightning Bolt" celebration pose. Now he's hoping to join the rarefied ranks of elite athletes who have successfully translated their talents from one sport into another. Recent high-profile attempts by athletes hoping to succeed in multiple sports have largely fizzled (see Michael Jordan's short-lived baseball career). Those who've been able to pull it off include Bo Jackson – the first player to be named to both the MLB's All Star Game and the NFL's Pro Bowl — and Deion Sanders, who once played in NFL and MLB games within one 24-hour period. Of course, the most successful sports transition took place more than 100 years ago, when Jim Thorpe followed up a famed college football career by winning Olympic gold medals in the decathlon and pentathlon — and then playing for years in both the MLB and NFL. Those lofty goals are almost certainly out of reach for Bolt, despite his obvious physical gifts and interest in soccer. Bolt attended the recent World Cup in Russia, and he played at charity and exhibition events over the summer, facing current and former pro players in England and France. In those matches, he showed the foot speed you would expect and managed to put some hard shots on goal — with one blast beating the goalie but dinging off the crossbar. Bolt has also trained with pro soccer teams in the past, including a visit in March to Germany's Borussia Dortmund. But that didn't translate into a deal, and many also noted that sportswear company Puma is a sponsor of both Bolt and Dortmund, suggesting the move was a publicity stunt. Money and publicity are also at stake in the talks to bring Bolt to Australia, where he could help lure fans to buy tickets and merchandise — and also collect a large paycheck, if he earns a contract. "The A-League has a $3 million marquee player fund, provided by Fox Sports to entice top talent to the league," the ABC's Simon Smale writes. "Both the Mariners and Bolt's agent Tony Rallis said the move was contingent on [the soccer federation] assisting with around $900,000 from that marquee fund. The question many are asking is whether those funds should be spent in this way." The Mariners play in Gosford, a city about 45 miles north of Sydney. Last season, the team won only four of its 27 games, finishing last in the league. Now, even as it basks in the sudden global attention of possibly putting Bolt on the pitch, the team warned that a deal wasn't yet finalized. "We won't know until it happens. It may not happen," Mielekamp said. "We've just got to keep a very level-headed approach to us." But the Mariners' CEO was also clearly enthused about the possibilities. "When he [Bolt] does perform and when he does score a goal, that's the big moment," he said. "That's the bit that everyone wants. Let's not shut the door on that opportunity. Let's see if it will become a reality."